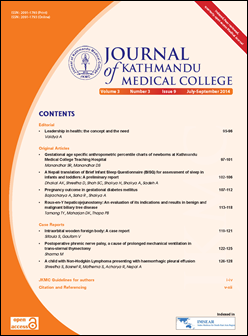 The official journal of Kathmandu Medical College, Sinamangal, Kathmandu. Full text articles available. Content also available on the journal's own website. JKMC is a multidisciplinary, peer reviewed, open access, quarterly journal which publishes a wide range of scientific works including original research paper, case reports, reviews, editorials, book reviews and articles from medical students. It includes work from basic science, clinical science, dental, nursing and other related medical fields. Journal of Kathmandu Medical College does NOT charge authors for article submission and processing fees.